Navigate to the Lifecycle Manager application for installing and configuring DataStax Enterprise clusters. Return to OpsCenter Monitoring after provisioning clusters. Lifecycle Manager performs provisioning and system configuration actions, which require secrets such as SSH credentials and DSE user passwords. Authentication is necessary for limiting access to LCM to authorized individuals only. See Configuring role-based security for details enabling OpsCenter authentication. Enabling TLS is necessary to protect these secrets during network transit, see Configuring SSL/TLS between OpsCenter and the DataStax Agents for details. 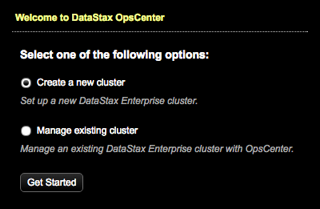 When you first launch OpsCenter, the Welcome to DataStax Opscenter dialog appears. Click Create a new cluster. Lifecycle Manager launches in another browser window. Click Lifecycle Manager from the OpsCenter navigation menu. Lifecycle Manager launches in another browser window. Within OpsCenter Lifecycle Manager, click OpsCenter Monitoring to return to monitoring DSE clusters in DataStax OpsCenter. Should you happen to open Lifecycle Manager in multiple browser windows or tabs, a dialog appears. Click the re-open LifeCycle Manager link to open Lifecycle Manager again. Click Reload the page to open OpsCenter monitoring. Click Go Back to return to the Welcome to DataStax OpsCenter dialog.